Gulliver XL, a child’s revolution is made by 125 schoolchildren and Susanne Marx. Primary school pupils, between the age of six and nine, dance, tell and fantasize about what their own neighborhood looks like in an ideal world. For a day they hijack the theater and share their own vision of the city. In a series of dancelsessons they create their own movements and text. In a period of four months in total, two schools in Amsterdam will work towards a final performance. In Gullivers Travels, the small people of Lilliput live in a harmonious and equal community on an island. A storm breaks loose and the giant Gulliver washes up on their island. The Lilliputians engage in a hilarious physical battle with the giant and tie him down, but they have to continue together. The children play and dance the roles of the Lilliputians and the giant is played by a dancer of ICK. With help of the Double Skin / Double Mind method and the Sensorium Toolkit for dance, Susanne Marx and the children create this performance in a series of dance lessons with self-created movements and texts. The children all work together in a group instead of the individual. 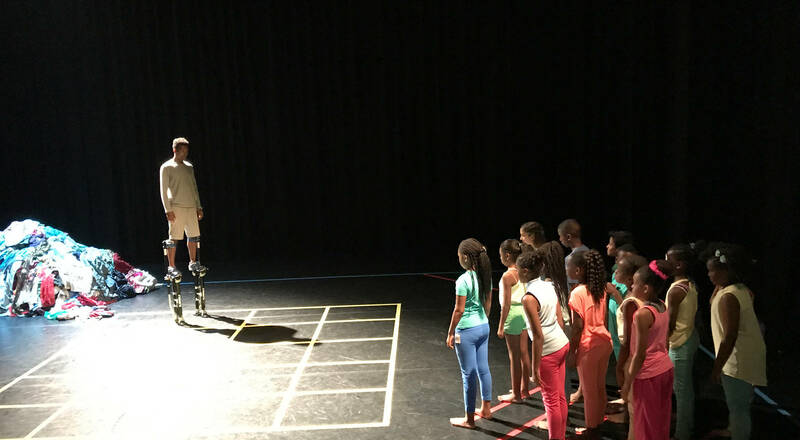 Choreographer and dance teacher Susanne Marx developed this innovative dance education project together with the Docent Dans opleiding at the Theaterschool Amsterdam, expert education network MOCCA and the International Theater Amsterdam. Gulliver, een reus in de Bijlmer (Teaser) from Moving Portraits on Vimeo. For more information about this project, please contact Sanne Liebregts.